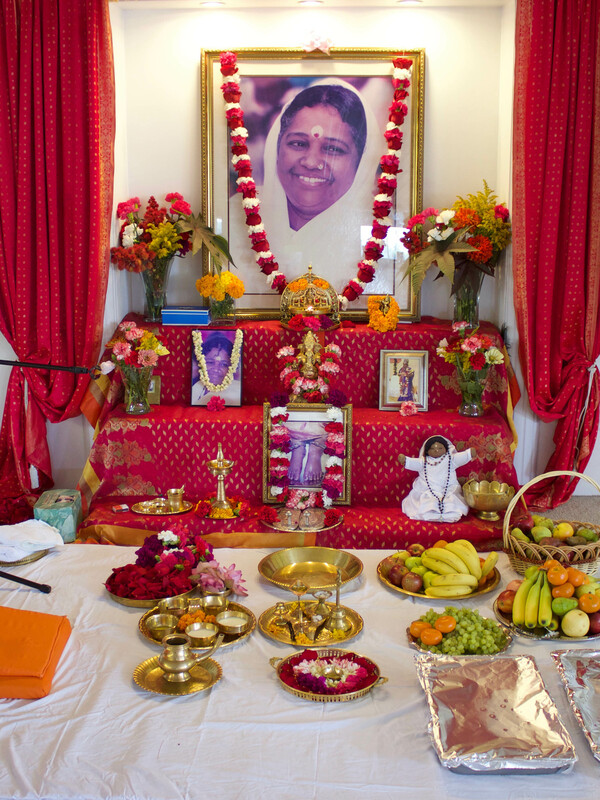 On Saturday, September 15 at 11:00 AM, Amma's Toronto Satsang had the blessing of celebrating Amma's birthday with Dayamrita Chaitanya Swamiji. 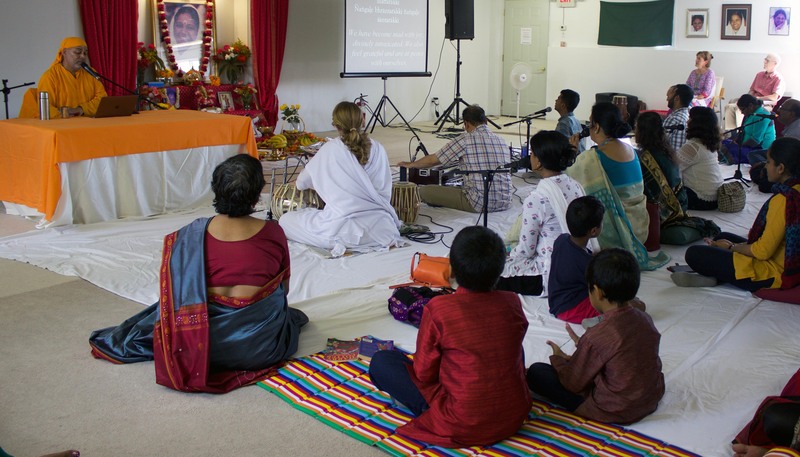 About eighty people were in attendance, including devotees from Quebec and British Columbia. After opening prayers, Dayamrita Swamiji guided everyone in an elaborate Manasa Puja (guided visualization). He directed the participants to breathe out all their stress and lethargy, and to inhale relaxation and focus. According to their personal preference, the devotees either visualized a sacred space filled with light (formless aspect of the Divine) or Amma's form sitting on a throne decorated with jewels and flowers (Divine with form). After mentally prostrating to Amma, the participants imagined offering her the light of a lamp, and fragrant incense. While Dayamrita Swamiji bathed Amma's padukas (silver sandals) with milk, ghee, yogurt, and honey, the devotees mentally visualized bathing Amma's feet with the same, all while mentally chanting 'Amma' or their mantra. As Dayamrita Swamiji dried Amma's padukas, and anointed them with chandan (sandalwood paste) and kumkum (vermillion powder), the participants imagined doing the same to Amma's feet. Swamiji then instructed everyone to visualize a tree growing in their heart, covered in blossoms of beautiful colour and fragrance. As they chanted Amma's 108 names, everyone mentally plucked flowers from this tree and offered them to Amma's feet. 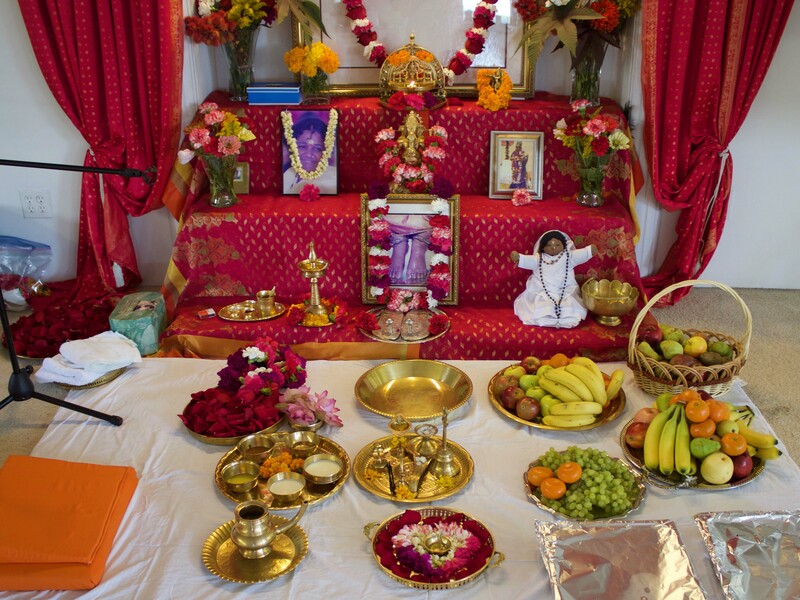 The devotees then visualized offering Amma sweet pudding, fruits, water, and milk with their own hands, and decorating Her body with jewellery and a garland of fresh flowers. Dayamrita Swamiji then told a story about a Guru who gives an attractive stone to his young disciple. The Guru instructs the boy to bring the stone to the marketplace and display it for sale. If anyone asks to buy it, he is only to raise two fingers and not say anything. In the end, he should not sell the stone. The boy does as he is told. At the market, a woman finds rock beautiful, and wants to put it in her garden. She asks the boy how much he will sell it for. The boy raises two fingers. "Very good," says the woman, "I will give you two dollars for it." The boy does not sell the stone, and returns to his Guru saying someone offered $2 for it. "Very good," says the Guru, "Now take it to the museum and see what they offer." At the museum, one of the curators sees the stone and says, "What a fine specimen! How much do you want for it?" The boy again raises two fingers. "Very well," says the curator, "I will give you two thousand dollars for it." The boy excitedly returns to his Guru saying: "They have offered $2000!" "Very good," says the Guru, "Now take it to the diamond merchant and see what he offers." The diamond merchant examines the stone with his eyepiece, and says, "Where did you get this? This is a very rare and precious diamond! How much do you want for it?" The boy again raised two fingers. "I will give you two million dollars for it," says the diamond merchant. The boy returns to the Guru, quite astonished. The Guru replies: "Now do you understand the value of the Guru?" Dayamrita Swamiji explains that different people perceive and evaluate the Guru according to their own understanding. So it is with Amma.To an ordinary person, Amma is a nice, simple woman who does a lot of charity. To a devotee, Amma is their Mother or a Great Saint. But to a disciple, Amma is everything: Guru, God, Paramatman (Supreme Being), and the only one who can take them across the ocean of transmigration (death and rebirth). Dayamrita Swamiji explained how, when he first met Amma, he was like the woman in the marketplace. He was not seeking a Guru. He thought Amma was just a nice, simple woman, and that Her parents and the others around Her were using Her to make money. Though he had some extraordinary experiences around Amma, he felt indifferent or even frightened by them. Amma, however, implanted in his mind an insatiable love for for Her. Dayamrita Swamiji's desire to constantly be near Amma made him want to join the ashram and become a brahmachari, like the others he saw around Her. When Dayamrita Swamiji expressed his desire to Amma, She laughed at him, saying: "You? Be a brahmachari? Go away!" Swamiji did not understand Amma's ridicule, but he didn't mind it, as long as he could remain near Her. After three years and several tests, Amma finally accepted Dayamrita Swamiji to join the ashram as a brahmachari. Naturally, Swamiji wished to be a good disciple. He followed the advice of his elders on how a disciple should behave: Always prostrate upon seeing the Guru. Never sit in the presence of the Guru; always stand straight with folded hands. When speaking to the Guru, cover your mouth so that your saliva does not inadvertently fall on Her. After following this advice for some time, Amma said to Swamiji: "What is wrong with you? Why are you behaving in this strange way with all these prostrations and hand gestures?" Dayamrita Swamiji replied: "Amma, I am trying to be a good disciple." Amma scoffed and said: "You will never be a disciple. Just be YOU." Swamiji was confused. How should he behave with Amma? He decided to follow the guidance of the Vedic tradition which says that one should respect all older women as one's own mother. Amma was right away pleased with his change of attitude. Viewing himself as Amma's child, Dayamrita Swamiji felt entitled to act immaturely and extract as much attention as possible from his mother. He would dictate to Amma what seva he should do and with whom. If he was sent away to a branch ashram, he would come back after a couple days or at most a week, saying he couldn’t be away from Amma for so long. When he left, he never cared if he had entrusted his responsibilities to someone who would take care of them. Eventually, Amma came up with a Master Plan to prevent him from always running back: She invited Swamiji with her to the USA after the second world tour. At the end of the trip, Swami Amritaswarupananda announced that Dayamrita Swamiji would be remaining in the USA. Dayamrita Swamiji was falling down with grief. Many times, he dreamt of taking the next flight back to India, or of swimming across the ocean to reach Amma. But whenever he became despondent or doubtful, long-time devotees would console him with stories of Amma. Since Amma's external form was not available, he had to internalize Her form and presence. 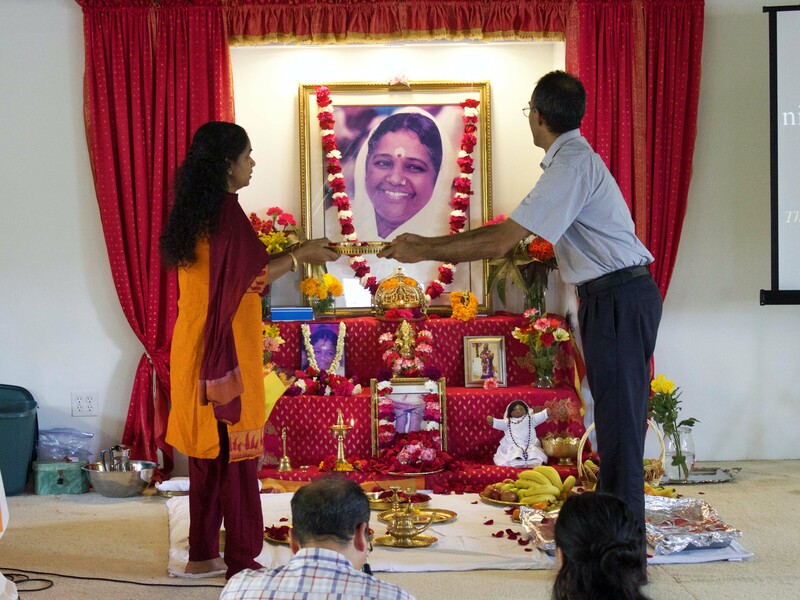 Most of us in North America share the experience of being far from Amma’s physical form. While this feels burdensome, it is actually a boon that Amma has given us. It gives us the opportunity to internalize our devotion and connect with Amma in our hearts. Connection to Amma on the physical level will come and go, but an internal connection to Amma is unbreakable. Amma has also said that Manasa Puja or mental worship of one’s Beloved form of God is the greatest form of puja (worship). 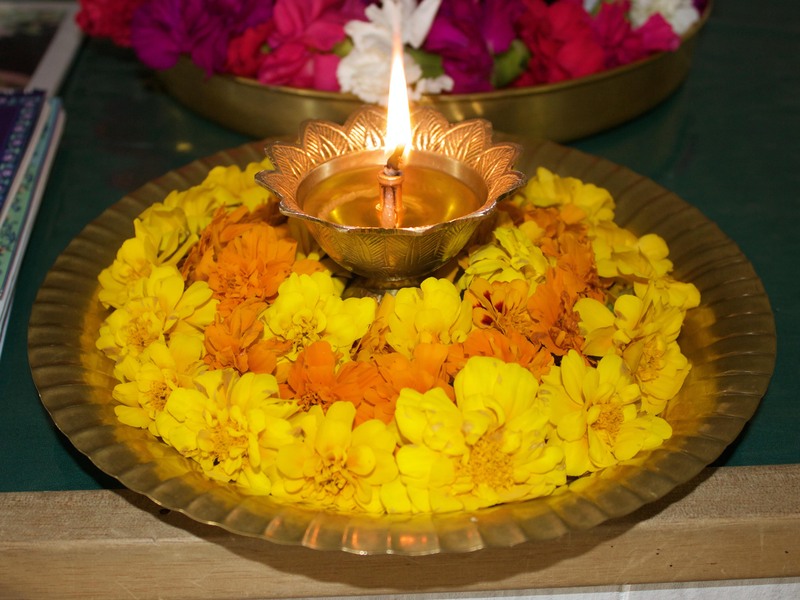 As we learn to perceive Amma in everyone and everything, each and every one of our actions, both internal and external, becomes Manasa Puja to Amma. Now when Dayamrita reflects on Amma, he feels like the boy who realizes he is holding the most precious diamond the world has ever known. May Amma give us all the gift of vision to understand who She really is! After the discourse, Ramanandji sang many beautiful bhajans: Innallo Karthika Nalu, Mangal Vadana, Ambike Devi, Come Children Leave All Your Sorrows (Omkara Divya Porule II), Azhikullil, Vagadeeswari Sarade, and Amritavahini. The satsang concluded with final Arati and closing prayers. Pairs of devotees waved the sacred flame before Amma, the One who shines Light on our path to the Supreme. May we all recognize the precious gift of Amma in our lives, and may we radiate Amma's love and light to all we encounter!